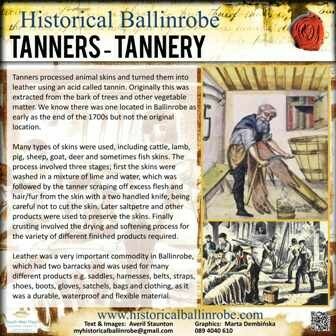 Tanners processed animal skins and turned them into leather using an acid called tannin. Originally this was extracted from the bark of trees and other vegetable matter. 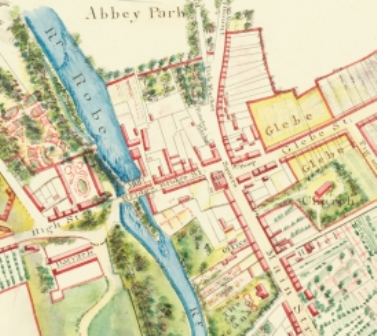 We know there was one located in Ballinrobe as early as the end of the 1700s but not the original location. Many types of skins were used, including cattle, lamb, pig, sheep, goat, deer and sometimes fish skins. The process involved three stages; first the skins were washed in a mixture of lime and water, which was followed by the tanner scraping off excess flesh and hair/fur from the skin with a two handled knife, being careful not to cut the skin. Later saltpetre and other products were used to preserve the skins. Finally crusting involved the drying and softening process for the variety of different finished products required. Leather was a very important commodity in Ballinrobe, which had two barracks and was used for many different products e.g. saddles, harnesses, belts, straps, shoes, boots, gloves, satchels, bags and clothing as it was a durable, waterproof and flexible material. This page was added by Averil Staunton on 15/02/2014.